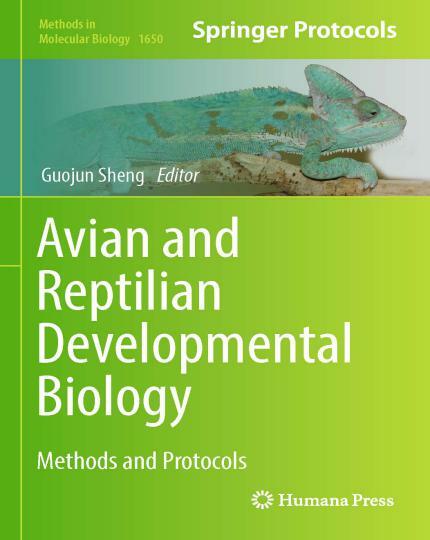 Avian and Reptilian Developmental Biology – Methods and Protocols, This volume discusses recent advances in avian and reptilian biology that have caused this diverse field to re-emerge. Birds and non avian reptiles are collectively referred to as sauropsid amniotes. The chick model, representing both the birds and the saurospids, made signiﬁcant contributions to the ﬁeld of developmental biology in the twentieth century. Its popularity has been waning due to the lack of tractable genetic tools, in contrast to rapid breakthroughs made in mammalian model systems. In the age of omics and stem cell biology, however, reliance on classical genetics is no longer a necessity. We are currently witnessing the re-emergence of avian and reptilian models as powerful tools in the developmental, evolutionary, eco-devo, learning, and behavioral research ﬁelds. The chapters in this book are divided into 4 parts: genomics and transcriptomics, genetic manipulation, stem cells, and new model systems. Part I details how to perform genomic and transcriptomic analyses in birds and reptiles; Part II highlights technological advancements in avian genetic manipulation; Part III focuses on methods to handle pluripotent cells; and part IV looks at the emerging models in avian and reptilian developmental biology.